Here at this page, you’ll have Deputy Commissioner Office Swat Jobs 2018 NTS Test & Roll No Slips Download. 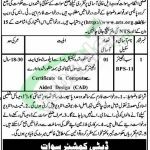 Applications are being offered from Deputy Commissioner Office Swat are available and it is seeking for highly educated, very experienced, hardworking and well-disciplined candidates for the following position such as (Sub Engineer BPS-11) is the post which needs to be filled by the Swat Domiciled applicants. Only one post is vacant to apply. NTS is authorized to conduct the test against this post. As the post has been revealed before you now the qualification which is required include DAE Diploma in Civil Engineering from any institute with Certificate in CAD is also required to apply. Age limit should be 18-30 years is required and the age relaxation will be given as per Govt of KPK rules. So guys, read the criteria carefully and then tap to apply. Now, I will let you know about its further details below. Application forms with deposit slip can be downloaded from the NTS Site as www.nts.org.pk. NTS will charge the applicants with Test Fee which needs to be paid in HBL, MCB ABL & Meezan Bank. Candidates are suggested to mention clearly the position applied for on the envelope. The last date for submission of application is March 02, 2018. Last Date to Apply: March 02, 2018. Address: NTS Head Office, Plot No, 96, Street No, 04, H-8/1, Islamabad.